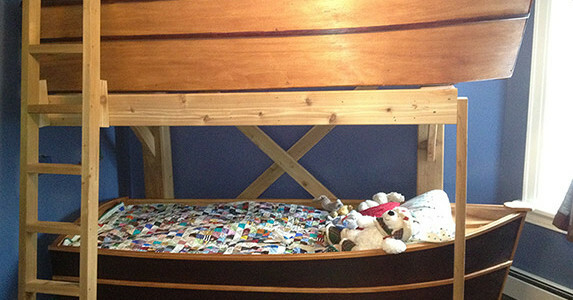 How fun for your kids to have a set of bunk beds made into the shapes of boats. Andrew Knutson saw something similar to this on the internet and wanted to build them for his sons. The original blueprints were in a different language, so Andrew had to use his carpentry expertise to determine the correct measurements to use. Once he figured that out he then needed to find the correct materials to use in order to get the boats shaped exactly right. Being that the boats are not a square shape, Andrew had to seek out the right kind of wood that he could bend to cover the outside of the boat. Andrew not only enjoys crafting up specialty projects such as this, he also excels at designing special/unique projects.